On November 9, 1989 — one generation ago — West and East Germans began dismantling the Berlin Wall. The course of the city’s already layered, traumatized history was profoundly transformed. Today, a new history is being written along the wall’s former lines of division. The iconic closed Berlin Templehof Airport, a site that arguably represents Germany’s Cold War history as much as the wall itself, served a pivotal role as an outpost for U.S. troops and allied air traffic in West Berlin. Today, in addition to its grounds functioning as an enormous public park, its shuttered hangars are being repurposed to temporarily house up to 2,300 refugees, many from war-ravaged areas exacerbated by conflicts with the West. Across Germany, city officials, from Hamburg and Heidelberg, are attempting to address the humanitarian crisis through adaptive reuse of unused sections of their urban cores. But this is most dramatically staged in Berlin, where historical reckoning and pragmatism often operate in tandem — and debates on architecture, infrastructure, and public space are routinely carried across multiple ruling regimes and political moments. Templehof’s history cuts across several eras of German division and liberation. Originally opened in 1923, its monumental terminal was refashioned by Nazi architects in the 1930s to serve as a grand gateway for Hitler’s Third Reich. After the war, the airport was later utilized by Cold War American forces waging another humanitarian mission: the airlift of supplies to occupied West Berlin during the Soviet blockade of 1948-1949. By 1951, the airport had been rededicated as a monument to the U.S. presence and power in postwar Germany. As for its functionality, Templehof reopened after the airlift, serving air travelers with commercial and military flights both before and after the wall’s construction in 1961. After the wall’s demise in 1989, flights from the airfield became less frequent and Templehof fully closed in 2008 as plans for a new international, post-reunification airport took shape, a hub that is still under construction. The airport’s charged history across eras of German political division also remains tied to what happened after the last airplanes sped off its runways. Resisting plans to redevelop the giant plot of land as a commercial property, citizens and planners waged a successful effort to reclaim it as an immense and free public space, resulting in one of the most spectacular reuses of traumatized architecture in the world . While the infrastructure of the airport remains in place, including its historic buildings and mile-long runways, the public can take advantage of a sprawling, 950-acre park area, open from sunrise to sunset. The potential for housing refugees in its massive, largely unused hangars is a reminder that adaptation and reinvestment are not neutral forces. The power of symbolic transformation and humanitarian uplift is worth more than any developer’s price tag. This new chapter for Templehof is another remarkable shift for a nation burdened with the weight of layered historical divides and a legacy of state violence. It seems as though the capital city of Berlin has once again become a stage for unlikely political possibilities and historic spaces rendered anew. 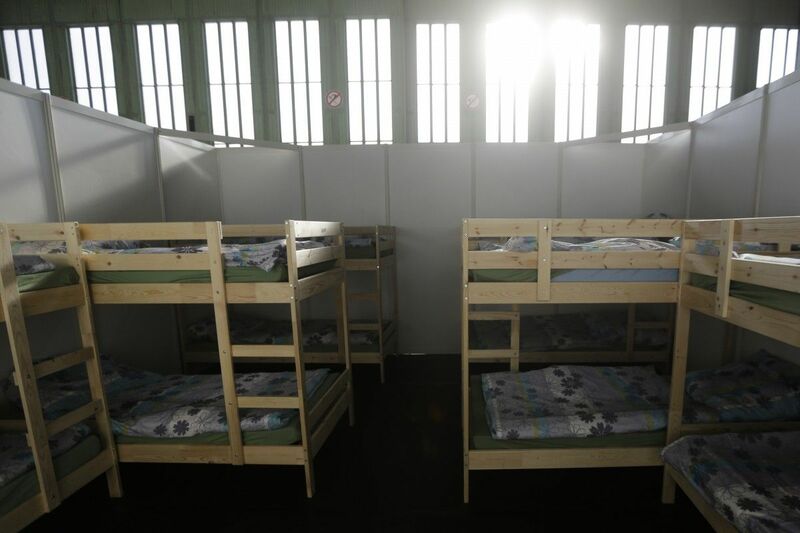 By repurposing one of their most contested sites for such urgent humanitarian use, Berliners can build a case for Germany as a moral leader of a new free world. If this resurgent role is one the nation wants, it must take the lead in dismantling contemporary border fortifications, whether on the edges of their territory or in the heart of their cities, by halting vigilante violence against asylum seekers and employing inclusive planning strategies that eventually pivot from temporary to more permanent solutions. The possibilities for such transformation aren’t limited to Berlin or Germany. In an open letter to President Obama, 18 U.S. mayors (including New York’s Bill de Blasio and Chicago’s Rahm Emanuel) made a plea for rapid immigration reform. These mayors argued that by welcoming more asylum seekers, the U.S. could ease the crisis acutely facing Afghans, Iraqis, and Syrians while at the same helping its own imperiled cities. In many U.S. cities, there is no shortage of structures that, like Templehof, are in need of new life. Already, cases have been made to use abandoned infrastructure and underinvested real estate in Atlantic City and Detroit as shelter for refugees. In 2014, Michigan Gov. Rick Snyder called for 50,000 immigrants to settle in Detroit and signed an executive order creating the Michigan Office for New Americans. Today, we have an opportunity to do more to a massive the refugee crisis and explore a vision of immigrant-powered urban revitalization. No American city was divided by a Berlin Wall or throttled by devastating war. But many cities faced decades of divisive policy and waves of divestment that wrought deeply etched fault lines, especially due to vigorous forms of racial and class exclusion. The effects and architecture of such charged histories remain as our legacies of division. The example of Templehof’s evolution, before and after the latest refugees arrived, should inspire more U.S. cities to imagine forms of reparative investment and reuse. This could forge bonds between asylum seekers and current residents in need of uplift. A crucial step for a new generation seeking to tear down walls may be to address pressing humanitarian needs while also transforming cities as open spaces of historical possibility. Paul M. Farber is a Postdoctoral Writing Fellow at Haverford College and the curator of The Wall in Our Heads: American Artists and the Berlin Wall.